St. Anne’s Church, Aigburth was built in 1836/37 to provide Christian worship for the occupants of the large houses recently built in the area, and for those who worked there and on local farms. As population increased, so did the size of the church, with additions to the fabric in 1853 and 1913. 1835 Messrs Moss, Booker, Tinne and Parker stated their intention to build a church in Aigburth, to provide a stipend and free sittings for the poor and humble classes. 1836 agreement with Wm Morrison, builder for a church, to plans and specification by Cunningham and Holme, architects. Foundation stone laid on 27th March [now lost]..
1837 right of presentation to the living vested in the four founding trustees and their successors. First service held Palm Sunday, 19th March. Proposals for a school at Aigburth. 1839 Church included in list of chapels belonging to the Church of England, Diocese of Chester, under the Act of 6 & 7 William IV, c.85*. [from returns made to the Registrar of Births, Marriages and Deaths by Registrars of Dioceses in England and Wales] * Marriage Act 1836. School opened in Aigburth Vale. 1852 Subscription raised to enlarge the church to provide more seats. 1853 Transepts built, and small chancel added. 1855 The new larger school in Aigburth Vale was opened. 1869 Parish Magazine introduced. Windows in left transept presented by J.A. Tinne. Windows in right transept presented by C. Saunders & J. Swainson. 1871 new organ, replacing the original. Hymns Ancient & Modern adopted. 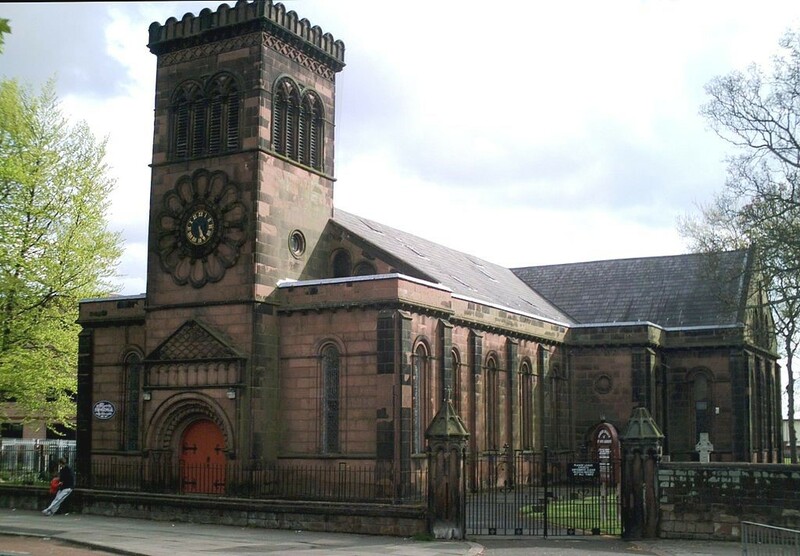 1875 Mossley Hill : St Matthew & St James opened., reducing area of Aigburth parish. 1876 All Hallows, Allerton opened. 1879 A Church Council established, to be appointed by vicar and wardens. 1894 Major restoration: side galleries in nave removed, church cleaned and painted, new floor throughout, new pews with central aisle provided, choir vestry built and organ removed from back gallery to left transept. One staircase to the back gallery was removed and the font installed in the space as a baptistery. New choir stalls. New stained glass windows. 1896 Reredos portraying the Last Supper donated by Mr Kershaw. 1907 Site for the Parish Hall donated by Mrs Gilmour. 1913 New chancel with vestries planned, with cost met by Mr John Temple, and furnishing by Mr Edward Paul. During the execution of this work the pulpit was destroyed by fire, attributed to arson by suffragettes. The organ was moved from the transept into the choir area of the chancel. 1917 Framework for the war memorial donated by Mr Wethered. 19?? War memorial plaque completed, book of remembrance created and stained glass memorial window installed in baptistery. 1928 Aigburth Methodist Church opened, their congregation having formerly met in other premises within the parish area. 1937 Centenary of the church: transepts screened and pews removed. Pews removed at back of church to give more space. Plans for a daughter church at a site in Holmefield Road were considered but not pursued. -1945 Bomb damage to many local houses with some loss of life. The chancel arch was later found to have been damaged by shock from anti-aircraft gunfire. Parish Hall requisitioned for official use. 1941 Girls’ school closed due to air raid damage. 1953/4 Church closed for repairs to chancel arch. Redecoration and other restoration work also carried out. 1961 St Margaret’s School opened on adjacent site, formerly occupied by Aigburth Lodge. The school had previously been established in Anfield. 1962 Celebration of 125th anniversary. Floodlit church and exhibition of local history were among the features. 1963 School in Aigburth Vale closed and buildings demolished. 1965 Central heating renewed. Anglican Hymn Book replaced Ancient & Modern. 1967 Series 2 Communion service introduced. 1970 First sermon by a Roman Catholic priest given in St Anne’s. 1977 Matins discontinued, replaced by the new Series 3 Communion service. 1987 150th anniversary of the consecration of the church celebrated with special services, a parish dinner, floodlighting, exhibition of local history. 1987/8 Plans drawn for an extension to the church transept to provide for Sunday Schools, meetings etc. 1990 Discovery of the urgent need to repair stonework and roof timbers, together with other essential work led to the abandonment of the extension and fund raising for the restoration began. 1992/7 Restoration work included elimination of rot in roof timbers, pointing and dressing of exterior stonework, new lighting for the chancel, full decoration of the interior. The former baptistery was re-ordered as a small chapel and the font placed at the font of the nave.